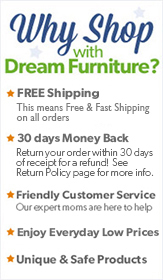 In order to provide our customers with the highest safety and quality furnishings, Dream Furniture is committed to testing every product for 100% compliance with all Federal and Consumer Product Safety Information Act (CPSIA) requirements, including mechanical hazards, lead and other heavy metals, phthalates and flammability. The California Air Resources Board (CARB) ATCM 93120 is a two-phase regulation limiting formaldehyde emissions from composite wood products being sold in California. Phase 2 is nearing its completion, and Dream Furniture maintains compliant with all products. All Dream Furniture upholstered products are flame-retardant and meet or exceed the flammability standard, Technical Bulletin 117, of California required by the California Products Safety Commission (CPSC). As the children's industry undergoes changes, Dream Furniture products remain compliant with all new regulations and procedures. Dream Furniture stands behind its products and upholds testing and inspections to ensure customer satisfaction and ease.